Natasha is spending her summer break like any other teenager: hanging out with friends, playing at a youth club and arguing with her parents. But her situation is far from ordinary. In January, rockets fell on her neighbourhood in Mariupol in southeastern Ukraine during a rebel attack that Kiev says left 30 dead in the government-controlled city of 500,000. Fortunately for 15-year-old Natasha, she was in another part of town when the missiles hit, but when she returned home she still had to see the devastating effects of the bombardment. “After that episode, it was at least a week until I dared to go out into the street because I was scared to leave my home,” she told IRIN. Mariupol is a strategically important port that would give the pro-Russian fighters a land corridor from rebel-held territory through to the annexed peninsula of Crimea. Despite the supposed February ceasefire, recent fighting has been intense near the city, especially around the village of Shyrokyne. The conflict, which started in April 2014 when separatist rebels took over parts of eastern Ukraine, has led to more than 6,500 deaths. Natasha said she regularly hears shelling but has become so used to the sounds of war that she no longer jumps or looks out the window after every sudden burst of noise. The effects are more subtle now. She says the conflict has made her more irritable and her moods more erratic. UNICEF launched a program at the end of last year to help children, like Natasha, caught up in Ukraine’s conflict. By partnering with schools and community centres, they offer psychosocial support, providing therapy through art, games and group discussion. It is only a first step. Children in need of more support are given in-depth psychological assistance. “This strategy has proven actually to be quite effective. It helps them to communicate and to open up… to basically alleviate their suffering,” UNICEF representative in Ukraine Giovanna Barberis told IRIN. The program has so far reached 30,000 children, but UNICEF estimates there are at least 100,000 in the Donetsk and Luhansk regions in need of support. A study by the UN agency found that 37 percent of children interviewed had been exposed to adverse or threatening events related to the conflict. In the outskirts of Mariupol, the program takes place in a former school in partnership with the Mariupol Youth Union, a drop-in centre that has been running for 15 years. The school, built in the first half of the 20th century, is in the middle of being renovated, but it was the best location in the city with enough space for all the children. Tiles are missing from the floor at the entrance, while new lockers stand in the hallway waiting to be unwrapped. In one room, psychologist Eugenia Stupnika gathers eight children around her, forming a circle while holding hands. Children here don’t talk so much about usual kids’ stuff. 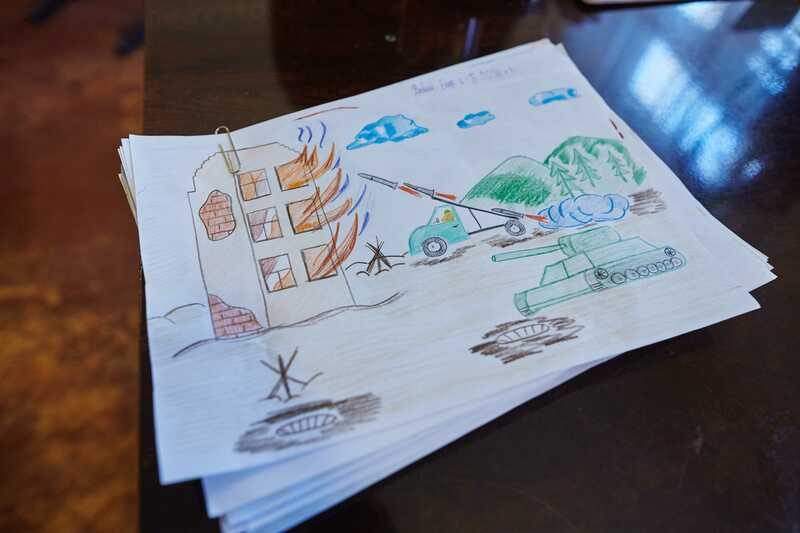 “Now, there’s a whole different theme that emerged and children talk about war and conflict and they talk about who heard what kind of shelling,” Stupnika said. The influence of parents can create conflict among the children because they inherit their different political views and end up arguing. And on other occasions, the children have difficulty expressing themselves, struggling to socialise or be creative. To combat this, one game has children move around the room without opening their eyes. Once they bump into another child, the pair has to navigate together which improves team-building and communication skills. Stupnika says she can see a difference as early as the second week of the program. Children in one group started as complete strangers, but by their second meeting they were coming up with ideas together for art therapy, a completely new concept for them. A group of internally displaced teenagers was told to sketch creatures made up in their imaginations. One picture showed a red-and-black bat-like animal with its fangs showing. Parents just don’t feel like they need to talk to them since they weren’t directly affected… but it nevertheless causes kids stress. Sharp teeth and jagged features were dominant aspects of the drawings, representing aggression and a need to protect oneself, according to Mariupol project coordinator Katarina Dochkina. The centre is often visited by children who are internally displaced and do not have a settled social circle to fall back on. The group dynamic of the program is especially valuable for them. “They left everything behind. Some of them moved just with their mothers, some just with their grandparents,” said Dochkina. According to the Ministry of Social Policy, 168,019 children were internally displaced in Ukraine as of June. Just because children are living at home with their families it doesn’t necessarily mean they are getting the proper support. Some parents feel that if their child hasn’t been close to the frontline, no discussion about their psychological or social well-being is necessary. “Parents just don’t feel like they need to talk to them since they weren’t directly affected… but it nevertheless causes kids stress,” said Stupkina. During one meeting, a child said her favourite thing about the day was that she was able to talk about war and peace even though she had not seen shelling. Some parents are too afraid to bring up the conflict with their children. Because of this, the program conducts field visits to families up to 10 kilometers from the frontlines, helping them learn how to talk to their kids. Fuelling demand is the ongoing violence, which has increased since an initial lull in fighting following the February ceasefire. Central parts of Donetsk city were shelled on Saturday for the first time since the agreement, killing one person. Both sides blamed each other. With the ebbs and flows of the conflict, children like Natasha in Mariupol do not want to think too much about their future, knowing it is in constant limbo. Natasha’s family is making plans to leave the city if the situation gets worse – what to bring and where to go. She dreams of becoming a teacher, but without knowing if her hometown will be safe in years to come, she doesn’t know where she will go to university. Only if, and when, her family resettles can she begin to think more concretely about her future.